As you can tell from my blogs and my tweets, I am an infographic-o-holic. It's no surprise that when I stumbled across this lovely historical infographic celebrating the 40th anniversary of email, created by ReachMail, I simply had to check it out. Our society embraces the Internet and all of the wonderful communication tools that developed as a result of it; we spend hours, days, months worth of our lives using it to spread our message worldwide. Electronic messages and email were only the beginning. 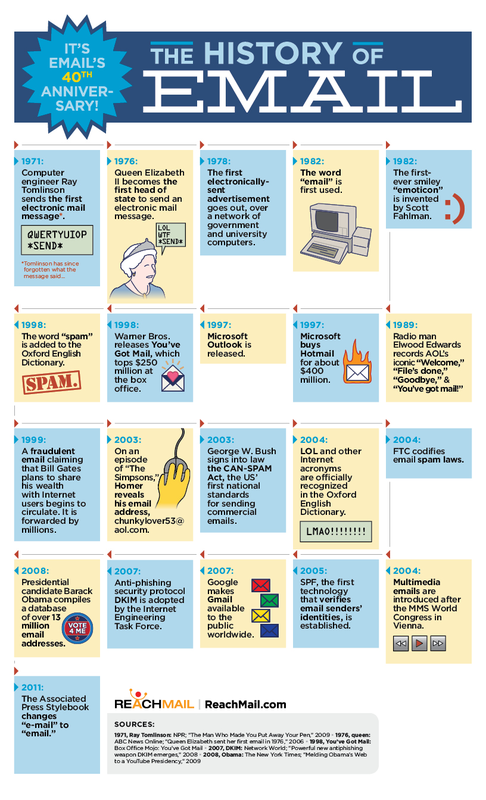 Most people don't know the history of email prior to the explosion of AOL and the "You've Got Mail" movie. While it's debatable whether communicating electronically has hurt or helped mankind and interpersonal relationships, it has brought a whole new cornucopia of opportunities to connect globally. This year, we tip our hats and pump our fists in salute to EMAIL!